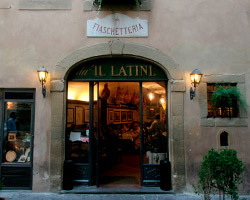 Il Latini is a nice restaurant just south of the duomo area. They don’t take reservations and a line forms quickly. We were lucky and managed to just beat the crowd when we went. The aged meat (which hangs from the ceiling) is amazing. 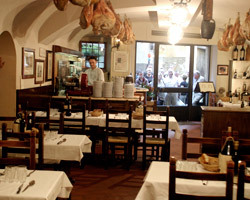 They also have a great appetizer with various meats from around Florence. Most of the tables are set for large parties, so you will likely sit with some other people if you are only a couple. We had a great time talking with our fellow diners, so this was a plus for us.